A proposal from The Holy Rood Guild in Spencer, Massachusetts, has been approved for Sacred Vesture for the Cathedral. The designs are noble and will be splendid in the Cathedral setting. 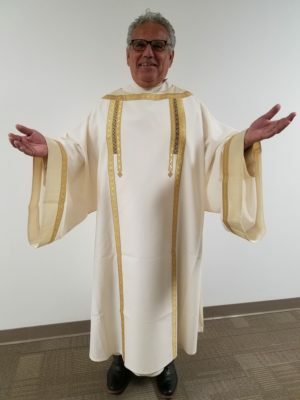 We ask you to consider to cover the cost for part or all of one dalmatic and matching stole. Please note credit card charges will apply.